Coastal Georgia was a beautiful place to be, last week. 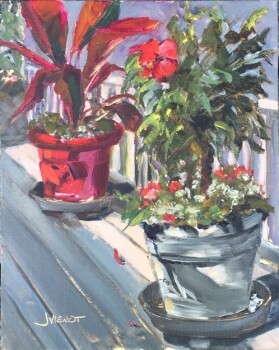 I drove from my home in Northwest Florida to St. Simons Island for a plein air painting working with Laurel Daniel, a fabulous artist whose work I have been watching for years, following her blog even before I ever decided to try plein air painting. Laurel is a master at ‘definitive suggestion’ in her work, leaving out just enough of the smaller details which invites the viewer to participate. I am a fan of this kind of work, because the longer the viewer will look at the piece, the more they will appreciate it, and not just see it and walk away. Last week I attended a plein air painting workshop in Apalachicola, Florida, taught by Morgan Samuel Price. The location of this fishing village is just two hours from my home, an easy drive but far enough away that I chose to stay in a rental property rather than commute. I learned so much I hardly know where to begin. It will probably take me years to assimilate it. The difficult thing about an intense learning situation, is that much of it is communicated abstractly in words and absorbed into the left brain, while painting is performed on the right side of the brain. Fortunately, Morgan demonstrated during and after each lecture, to help us make right-brain sense of the concepts she was teaching. And she didn’t seem to mind repeating answers while each of us gained just enough understanding to ask the same question the previous student had just asked. “Morgan, what colors are you using now?” “Ultramarine blue, cadmium red light, and hansa yellow,” Morgan would answer. And the next student would ask, “Morgan, what colors did you mix to get this color?” And Morgan would patiently answer, “Ultramarine blue, cadmium red light, and hansa yellow.” To be fair, though, the different colors we were asking about were entirely different colors — it’s just that Morgan is a wizard at color mixing, and can make any color on the palette out of ultramarine blue, cadmium red light, and hansa yellow. We had some good sunshine the weekend before the class, but our only sunny day during the class was the first day, Monday. After watching Morgan paint a simple alleyway with so many luscious values and such obvious perspective, making it look oh-so-easy, she turned us loose to paint in the afternoon. I choose the bright yellow siding of the Inn where everyone else was staying, and tried to capture the perspective of the sidewalk receding toward the church in the background. Even in my frustration (left brain / right brain confusion), I already had begun to learn. It is in the struggle that I find I truly learn, whether the painting shows that learning or not. There is some confusion between the palm tree and the porch roof which makes the porch roof look like it is angled wrong — it’s not. But as we joked in class, sometimes we need arrows and words printed on our painting to explain different elements. My painting of the Inn could use several arrows. The next day we drove to St. George Island, and I painted a grove of scrub oaks which had a play of light on the tree trunks that interested me. I struggled with that light, but Morgan said to be definite with it — so I put down my tentative little brush and made some bold swaths of light, giving it much more of the feel that I wanted. On Wednesday, two of the other students and I got lost from the rest of the class. We painted near the base of the bridge to SGI, at a marina. I painted on 16×20 canvas panel instead of my usual 8×10. I enjoyed using bigger brushes, but found myself being very stingy in mixing my colors, never mixing enough paint. It’s difficult to paint with no paint on your brush. Thursday found us at Scipio Creek, at another marina at the north edge of Apalachicola. The pelicans and seagulls put on a continuous show for us while we caught the hazy pinks and lavenders in the middle ground and the muted grays in the distance, in contrast with the richer colors and more contrasting values in the foreground. And then, sadly, it was Friday. I painted beneath the overhanging deck of ‘Up the Creek’ Restaurant, with a vicious thunderstorm popping lightning all around me. Nearby strikes three times chased me back further underneath to the center of the marine storage area under the building, which I imagined was safer. All of the colors of my scene were washed out, at times it being so dark there was no color at all. The last thing I painted were the reedy grasses and trees in the background, when suddenly I realized it was time to critique, so I packed up and hurried back. I will dim the intensity of color on that foliage to make it recede more — it’s a little too bright, like the sun is shining on it, which it wasn’t. A plug for my excellent host, the owner of the property where I stayed, Robert Lindsley: Visit the Robert Lindsley Studio and Gallery at 15 Avenue E near the waterfront in Apalachicola. And to the VRBO agent, my new friend Mike Klema — just search “VRBO Apalachicola” for Vacation Rentals By Owner, and Mike’s units will come up. He was very accommodating, and I loved my place behind the island, right on US 98! I had the thrill of seeing both the sunrises and the sunsets, as well as the parade of fishing boats every morning, and the abundant species of birds. I’ve posted below a few photographs of my week, which all in all I enjoyed very much. It’s a rainy day in Florida today. For being the Sunshine State, we certainly have had our share of rain this year, at least in Northwest Florida, where I live. Our plein air painters group was scheduled to paint at Grayton Beach State Park today. With 100% chance of rain, and with it already 100-percenting since the wee hours of the morning, accompanied by flash-flood warnings, it is not surprising that only two of us showed up. I was first to arrive, choosing a pavilion where I could see the distinctive stand of trees across the lake, that everyone here knows as the Umbrella Trees. The rain had slowed to barely a sprinkle and some little woods rats were squirreling around in the wildflowers beside the pavilion. I would see something move out of the corner of my eye, and then if I kept looking, I would see the second one follow the first. They were completely camouflaged when they were still. Soon after fellow plein air artist Ed Nickerson joined me, the bottom fell out of the sky again. Colors in the distance muted to grays, and the foreground colors intensified by contrast. We both had time to paint two small paintings before the mist of heavy raindrops bouncing off the tin roof and blowing onto us chilled me to the bone. I headed over to Grayt Grounds for a cup of good coffee before running an errand and returning to my studio.